In this article, we describe a protocol for fabricating an amelogenin-chitosan hydrogel for superficial enamel reconstruction. Organized in situ growth of apatite crystals in the hydrogel formed a dense enamel-restoration interface, which will improve the effectiveness and durability of restorations. Ruan, Q., Moradian-Oldak, J. Development of Amelogenin-chitosan Hydrogel for In Vitro Enamel Regrowth with a Dense Interface. J. Vis. Exp. (89), e51606, doi:10.3791/51606 (2014). Biomimetic enamel reconstruction is a significant topic in material science and dentistry as a novel approach for the treatment of dental caries or erosion. Amelogenin has been proven to be a critical protein for controlling the organized growth of apatite crystals. In this paper, we present a detailed protocol for superficial enamel reconstruction by using a novel amelogenin-chitosan hydrogel. Compared to other conventional treatments, such as topical fluoride and mouthwash, this method not only has the potential to prevent the development of dental caries but also promotes significant and durable enamel restoration. The organized enamel-like microstructure regulated by amelogenin assemblies can significantly improve the mechanical properties of etched enamel, while the dense enamel-restoration interface formed by an in situ regrowth of apatite crystals can improve the effectiveness and durability of restorations. Furthermore, chitosan hydrogel is easy to use and can suppress bacterial infection, which is the major risk factor for the occurrence of dental caries. Therefore, this biocompatible and biodegradable amelogenin-chitosan hydrogel shows promise as a biomaterial for the prevention, restoration, and treatment of defective enamel. Dental enamel is the hard mineralized surface of human teeth. It is composed of numerous needle-like apatite crystals, which are bundled in organized, parallel prisms to ensure the unique mechanical strength and biological protection that enamel provides1-2. Unlike other mineralized tissues, such as bone and dentin, mature enamel is acellular and cannot regenerate itself after substantial mineral loss1-2, which often occurs as dental caries or erosion. Commercially available products such as fluoride containing varnishes, tooth pastes and mouthwashes are effective in re-mineralizing enamel but none of them have the potential to promote the formation of organized apatite crystals. Clinically, the conventional treatment for enamel repair involves a filling procedure with artificial materials such as amalgam, ceramics, or composite resin 3. However, these materials usually do not interface well with the natural tissue surrounding the lesion, because their structures, components and properties are different from the natural enamel. As a result, secondary caries frequently develops overtime at the interface between the tooth and foreign materials. Therefore, in situ regrowth of enamel with a dense interface is an attractive target for the fields of materials science and stomatology. One particularly promising way to achieve this purpose is biomimetic synthesis of enamel-like material on the enamel surface. Recently, numerous in vitro attempts have been made to prepare enamel-like materials using biomimetic systems that contain nano-apatites or different organic additives 4-12. However, developing the optimal biomimetic strategy to promote remineralization crystals to achieve a perfect dense interface is still a challenge. During enamel mineralization, the oriented growth and elongation of apatite crystals is regulated by an amelogenin-rich matrix 1,13-14. To mimic the organic matrix in developing enamel, herein we describe a detailed protocol for fabricating an amelogenin-chitosan (CS-AMEL) hydrogel for in situ enamel regrowth on an acid-etched enamel surface used as a model for erosive lesions. As “the most versatile growth media” for crystals 15, hydrogel matrices have an advantage over a solution system since clinically they are easier to handle. Moreover, CS-AMEL is biocompatible, biodegradable, and has unique antimicrobial and adhesion properties that compare favorably with other biomimetic systems for dental applications 16. Importantly, the in situ mineralization of apatite crystals on the enamel surface provides a dense interface between the repaired layer and the natural enamel, which can potentially improve the durability of restorations and prevent the formation of new caries at the margin of the restoration. The human molars were extracted following the standard procedures for extraction at the Ostrow School of Dentistry of the University of Southern California and handled with the approval of the Institutional Review Board. Select a human third molar without any restored caries. Remove the root portion of the molar, and cut the crown of the molar longitudinally into slices 2 mm thick using a water-cooled low-speed diamond saw. Ultrasonically clean these slices for 2 min, and then rinse them with deionized water 3 times. To simulate erosive lesions, etch the tooth slices with 30% phosphoric acid for 30 sec then immediately rinse them with deionized water. Ultrasonically clean the etched slices for 2 min, and then rinse them with deionized water 3 times. Dissolve 1% (w/v) chitosan (medium molecular weight, 75-85% deacetylated) in a 1% (v/v) acetic acid solution followed by stirring at 80 °C O/N. After cooling the solution to RT, filter the chitosan solution using a 0.45 μm filter. Adjust the pH value to 5.0 by adding 1 M NaOH solution. Weigh out calcium chloride (CaCl2) and prepare a 0.1 M solution, then mix using a vortex until the solution is clear. Adjust the pH value to 11 by adding 1 M NaOH solution. Weigh out dibasic sodium phosphate (Na2HPO4) and prepare a 0.1 M solution, then mix using a vortex until the solution is clear. The recombinant full-length porcine amelogenin (rP172) used here has 172 amino acids and is an analog of full-length native porcine P173, but lacking the N-terminal methionine as well as a phosphate group on Ser16 18. Add 20 g of Lysogeny broth (LB) Agar powder into 500 ml deionized water, autoclave the solution at 121 °C (liquid setting) for 20 min. Let agar cool to ~ 55 °C, add ampicillin (100 μg/ml) into agar solution. Transfer the agar solution to Petri dishes, let each plate cool until it is solid, then flip to avoid condensation on the agar. Store plates in plastic bags at 4 °C. Streak the LB agar plate with recombinant cells (E.coli–BC21) from the glycerol stock (-80 °C). Incubate the plates O/N at 37 °C. Prepare 50 ml of NZCYM media and autoclave the media at 121 °C for 30 min. Allow the media to cool down, add 50 µl of 100 µg/ml ampicillin to the 50 ml media. Inoculate a single colony from the LB agar plate into the 50ml NZCYM media supplemented with ampicillin. Incubate the cells O/N in a shaking incubator at 37 °C. Prepare 1 L of NZCYM media and autoclave the media at 121 °C for 30 min. Add 1 ml of 100 mg/ml ampicillin to 1,000 ml media. Take an optical density (OD) reading as a blank using a UV-Vis spectrophotometer. NOTE: Do not discard this after first reading. Inoculate 10 ml of the cell culture from step 2.3.5 into 1,000 ml media from step 2.3.6. Read the optical density at 595 nm immediately after inoculation. Take the optical density reading periodically to keep track of the growth. NOTE: Read the blank each time the OD is taken. Induce with 700 µl of Isopropyl β-D-1-thiogalactopyranoside (IPTG, 1 M) when the bacterial growth reaches to about 0.75~0.8 OD at 595 nm. Harvest the cells when the OD reaches 1.1. Pour the contents of the flask into 6 plastic bottles. Balance and weigh the bottles before using the centrifuge. Centrifuge for 20 min at 8,554 x g at 4 °C. Keep the cell pellet in the -20 °C O/N. Take out the cell pellets and combine them in a 50 ml tube. Add 3.5 ml of 4M Guanidine HCl per L of fermentation. Sonicate 2-3 times on ice, 30 sec each time, with 1 min intervals. Make 6x dilutions of cell volume with 0.5% formic acid and let it stir in the cold room for 2 hr. Centrifuge for 30 min, 8,554 x g at 4 °C. Keep the supernatant. Add 20% Saturated ammonium sulfate using the saturated stock solution and stir in the cold room, O/N. Centrifuge for 30 min, 8,554 x g at 4 °C and keep the pellet. Reconstitute the pellets in 0.1% trifluoroacetic acid (TFA), load onto a C4 column (10 x 250 mm, 5 µm), and fractionate using a linear gradient of A=0.1% TFA and B=60% acetonitrile in TFA, at a flow rate of 1.5 ml·min-1. Freeze the protein solution on dry ice and lyophilize the frozen sample O/N. Add 200 µg of rp172 into a tube containing 960 µl of 1% chitosan solution, then mix using a vortex until the solution is clear. Add 25 µl of 0.1 M CaCl2 solution followed by 15 µl of 0.1 M Na2HPO4 solution to the amelogenin-containing chitosan solution, then mix using a vortex for 5 min. Adjust the pH of the CS-AMEL solution to 6.5 by carefully adding 1 M NaOH solution. CS-AMEL hydrogel will form when the pH value reaches 6.5. Dissolve a certain amount of magnesium chloride (MgCl2, 0.2 mM), calcium chloride (CaCl2, 1 mM), potassium dihydrogen phosphate (KH2PO4, 4 mM), potassium chloride (KCl, 16 mM) and ammonium chloride (NH4Cl, 4.5 mM) in 20 mM HEPES (4-(2-Hydroxyethyl)piperazine-1-ethane-sulfonic acid) buffer12. Adjust pH to 7.0 with 1 M NaOH and store the artificial saliva solution at 4 °C. Before using the solution, add sodium fluoride (NaF, 300 ppm). Apply about 20 µl CS-AMEL hydrogel to the etched tooth slice using a syringe (Figure 1B). Dry the hydrogel-covered tooth slice in a desiccator at RT for 2 hr. Transfer the tooth slice to a beaker containing 30 ml of artificial saliva solution. Cover the beaker with aluminum foil, and then keep the beaker in an oven at 37 °C for 7 days. Remove the tooth slice and dry it in a desiccator at RT. 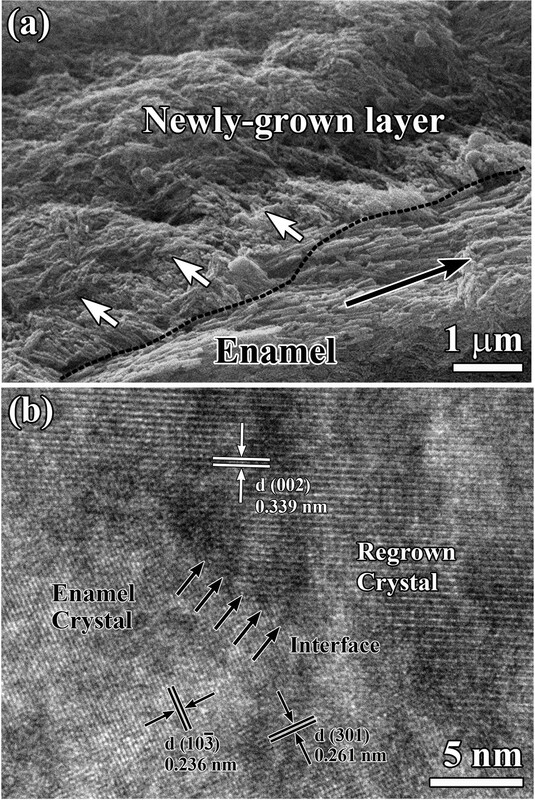 The microstructure of the interface between the newly grown layer and enamel was observed by scanning electron microscopy (SEM) and high revolution transmission electron microscopy (HR-TEM). The TEM sample was prepared using a focused ion beam (FIB) technique, the steps for which are as follows. Load the sample into a FIB-SEM instrument and finish all the alignments according to the operating instructions. NOTE: Fine Z adjustment should be performed at least 2 times. Deposit a carbon layer (15 × 3 µm) on the sample to protect the underlying structure (Figure 2A). Mill the sample carefully at the upper, lower and right sides of carbon layer to prepare a thin piece of sample, and then cut the bottom side of this thin piece. NOTE: Check the Ion beam alignment before each milling step (Figure 2B). Weld a Pt tip on the thin piece and cut the left side to separate the sample piece (Figure 3C). NOTE: Check the Ion beam alignment before the welding step. Lift out the Pt tip with the sample slowly, and mount the lamellar sample onto a lift-out TEM grid. Detach the tip from the sample, and thin the sample until its thickness is less than 100 nm (Figure 3D). Remove the sample from the instrument to perform the TEM observation. NOTE: Check the Ion beam alignment before each thinning process. The binding strength is assessed by ultrasonic treatment. Keep the repaired tooth slice in an ultrasonic cleaner (42 kHz, 100 W) for 10 min, and then observe the interface between the repaired layer and natural enamel with a backscattered-electron SEM analysis. Measure the hardness and elastic modulus at 20 test points on each repaired enamel surface (n=3) by a nano-indenter with a Berkovich tip. Wash the tooth slice with Tris buffer saline (TBS) for 15 min. Block with 1% bovine serum albumin (BSA) in TBS for 15 min. Remove the liquid and incubate the sample O/N with 1°Ab (1:500 Chicken Anti-Amelogenin) diluted in TBS (0.1% BSA, 0.3% Triton X-100). Wash the sample with TBS for 30 min and incubate O/N with 2°Ab (1:100 Anti-chicken FITC) diluted in TBS. Wash the sample with TBS for 30 min and leave to dry for another 30 min. The effectiveness of the protocol described here is demonstrated by scanning electron microscopy (SEM), selected area electron diffraction (SAED) and X-ray diffraction (XRD) analyses. After repair by amelogenin-chitosan (CS-AMEL) hydrogel for 7 days, an enamel-like layer with a thickness of 15 μm was formed on the etched enamel surface. 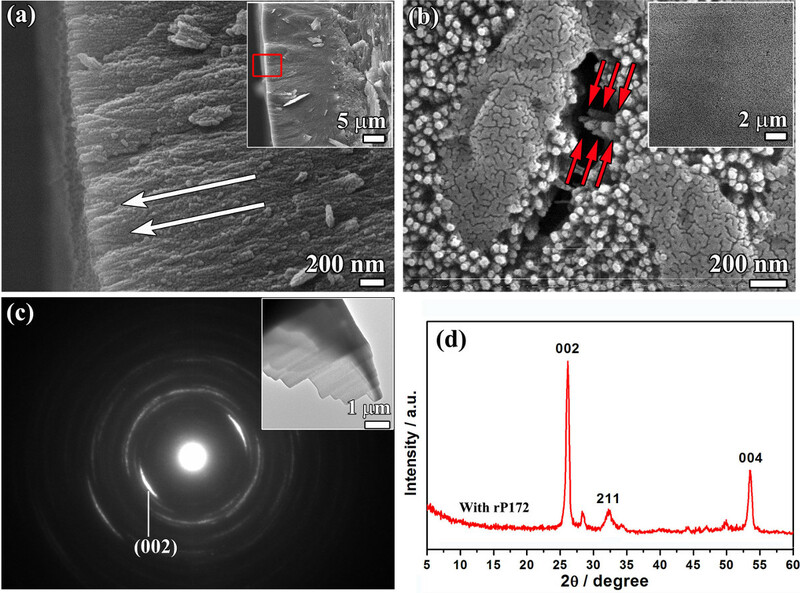 The newly-grown layer was made of highly ordered arrays of crystals with a diameter of ~50 nm, growing preferentially along the c-axis, perpendicular to the surface (arrows in Figure 3A). It is noteworthy that these needle-like crystals were organized into bundles, which are similar to the fundamental units of natural enamel (Figure 3B). The SAED result of repaired layer exhibited an arc-shaped pattern revealing a hierarchical alignment of the newly grown crystals along the  direction (Figure 3C). XRD analysis confirmed that the newly-grown layer was composed of apatite crystals, which were aligned along the crystallographic c-axis, in accordance with the SEM and SEAD observations (Figure 3D). Figure 4 shows the microstructure of the interface between the newly-grown layer and natural enamel. Note that the crystals did not grow in the same directions as original enamel crystallites. It can be seen that the protein-mediated apatite growth resulted in a perpendicular orientation of newly-grown crystals relative to the natural enamel crystals (Figure 4A). The proposed repair mechanisms including stabilization of Ca-P clusters and their subsequent organized crystallization by amelogenin have been presented in our previous study16. The distinction between newly-formed and original crystals has been revealed by the fast Fourier transform (FFT) analysis which showed different patterns indicating that the crystals in the enamel and in the fused repaired layer grew with different orientation16. Furthermore, there is no apparent gap at the interface between the repaired layer and the enamel substrate. At the nanoscale, the enamel and the regrown crystals fused together to form a seamless interface (Black arrows in Figure 4B). The bonding strength between the repaired layer and natural enamel was assessed by ultrasonic treatment 16. After sonication for 10 min, the newly grown layer formed in the CS-AMEL hydrogel was still tightly bound to the enamel surface (Figure 5A), and the organized structure was preserved (Figure 5B). For the sample treated with chitosan hydrogel without amelogenin, however, a large gap between the enamel and a repaired layer was observed following the ultrasonic treatment (Figure 5C). To clearly distinguish between the newly-grown layer and the natural enamel, the amelogenin in the newly-grown layer was Immunofluorescence labeled. The presence of amelogenin was demonstrated by the green immunofluorescence in the newly grown layer (Figure 6). Mechanical properties such as hardness and elastic modulus of the newly grown layer were analyzed by nanoindentation test 16. As shown in Figure 7, following acid etching the hardness and modulus of enamel surface declined nearly 98% and 88%, respectively. The control group treated by chitosan hydrogel without amelogenin only showed limited improvement in both hardness and modulus. In contrast, after mineralization in the CS-AMEL hydrogel, we observed an increase of nearly 4 times in modulus and 9 times in hardness. Figure 1. Photographs of amelogenin-chitosan (CS-AMEL) hydrogel. (A) Image of a typical CS-AMEL hydrogel. (B) Application of the CS-AMEL hydrogel on an acid-etched tooth slice. Figure 2. Typical focused-ion-beam process for TEM sample preparation. (A) Deposition of a carbon layer on repaired enamel surface. (B) Milling the sample carefully around a carbon layer to prepare a thin piece of sample. (C) Welding the Pt tip on the thin piece. (D) Thinning the sample until its thickness is less than 100 nm. Please click here to view a larger version of this figure. Figure 3. Characterization of newly-grown layer after mineralization in amelogenin-chitosan hydrogel for 7 days. (A) After 7 days of mineralization with amelogenin-chitosan hydrogel, an enamel-like layer formed on the surface of the etched enamel. Inset shows thickness of newly-grown layer; rectangle shows the area corresponding to A. White arrows indicate the apatite orientations in the newly-grown layer. (B) Bundles of organized crystals were found inside the repaired layer. The arrows point to a typical bundle of parallel crystals inside the newly-grown layer. Inset shows the homogeneous surface of the repaired layer. (C) Selected area electron diffraction (SAED) image of the newly-grown layer. Inset shows TEM image of the repaired layer prepared by focused ion beam (FIB) milling. (D) XRD spectra of newly-grown layer after mineralization in an amelogenin-chitosan hydrogel for 7 days. Reproduced with permission from reference 16. Please click here to view a larger version of this figure. Figure 4. Microstructure of interface between the newly-grown layer and natural enamel. (A) Cross-section SEM image of repaired layer after remineralization in amelogenin-chitosan gel for 3 days, showing newly-grown layer fused to the surface of the natural enamel. The white and black arrows indicate the crystallographic orientations of the crystals in the newly-grown layer and natural enamel, respectively. The dotted line shows the boundary of the natural enamel and the newly grown layer. (B) HRTEM image of the interface between the enamel and regrown crystal, showing seamless growth of repaired crystal on the enamel. The black arrows indicate the interface between regrown and enamel crystals. Reproduced with permission from reference 16. Figure 5. Binding strength between newly-grown layer and enamel surface. 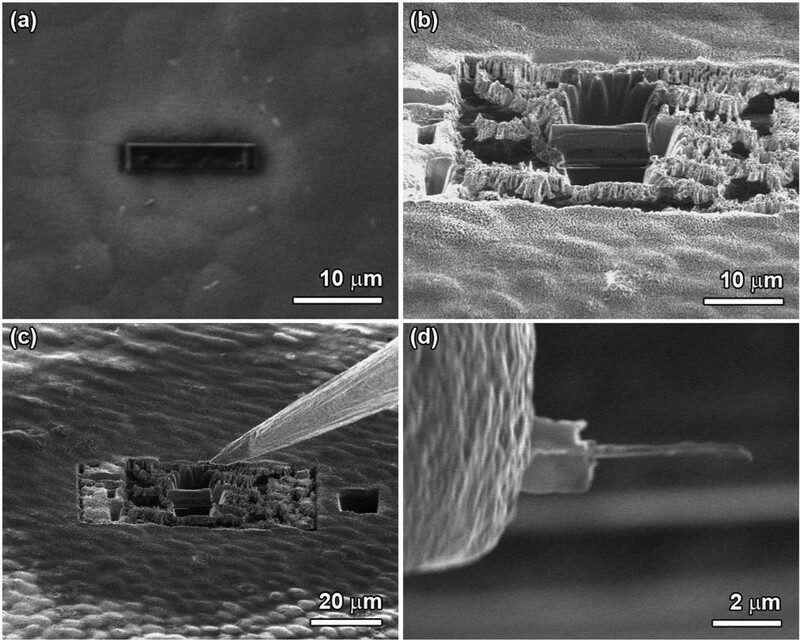 (A) Backscattered electron image of the cross section, and (B) second electron image of the surface of an ultrasonically-treated newly-grown layer obtained with chitosan-amelogenin hydrogel. Inset shows the typical morphology of the surface at a higher magnification. (C) Backscattered electron image of the cross section of an ultrasonically-treated newly-grown layer obtained with chitosan hydrogel without amelogenin. Reproduced with permission from reference 16. Please click here to view a larger version of this figure. Figure 6. Fluorescence images of the cross section of the newly-grown layer. Rectangle in A represents the selected area corresponding to B. The arrows in B indicate the newly grown layer on the enamel surface. Please click here to view a larger version of this figure. Figure 7. Hardness and elastic modulus of healthy enamel, etched enamel, and reconstructed enamel repaired by chitosan hydrogel with and without amelogenin. The indent area was similar to what has been previously reported 19. Reproduced with permission from reference 16. While the mineral content of enamel is high making it the hardest mineralized tissue in the human body, this bioceramic is susceptible to demineralization processes, which often occur as dental caries or erosion. Gene mutations can also cause thin or soft enamel leading to a series of inherited diseases of enamel malformation called Amelogenesis Imperfecta20. Oral health-care products containing fluoride or CPP-ACP have been on the market for several years (i.e., varnishes, tooth pastes and mouthwashes) to promote remineralization of initial enamel lesions. However, none of these commercially available products have the potential to promote the formation of organized apatite crystals. The conventional treatments for deep enamel cavities involve mechanical drilling and subsequent filling with artificial materials such as amalgam, ceramic or composite resins. Such approach is not ideal for early lesions and cases when large areas of erosion occur on enamel. This is because a disproportionate amount of healthy enamel must be removed bringing more damage to the tooth. Amalgam and composite resins only temporary 'repair' the tooth and such fillings typically do not stop the tooth's decay. Robust adhesion between original tooth surface and that of the filling materials is a challenge because of material shrinkage and differences in chemical composition and microstructure. One alternative strategy to overcome the above challenges is to regrow an enamel-like layer directly onto the original enamel surface when tight chemical contact to the natural substrate can be formed. In this video article, we present a novel enamel reconstruction strategy that uses an amelogenin-chitosan (CS-AMEL) hydrogel to grow organized crystals in vitro on an enamel surface. Compared with other biomimetic treatments, CS-AMEL hydrogel is easier to prepare for clinical use. Besides the biocompatibility and biodegradability, it has unique antimicrobial and adhesion properties that are important for dental applications16. Another advantage is that the robust interface between the synthetic and natural enamel crystals promotes strong bonding between the newly grown layer and the tooth surface. In clinical dentistry weak bonding is a main reason for the restoration failure of the currently available materials. Poor adhesion usually results in gaps at the enamel-restoration interface, which increase the risk for bacterial leakage and secondary caries. Therefore, the robust attachment of the newly grown layer formed in the CS-AMEL hydrogel has the potential to avoid the formation of new caries at the margin of the restoration and improve the durability of the restorations. 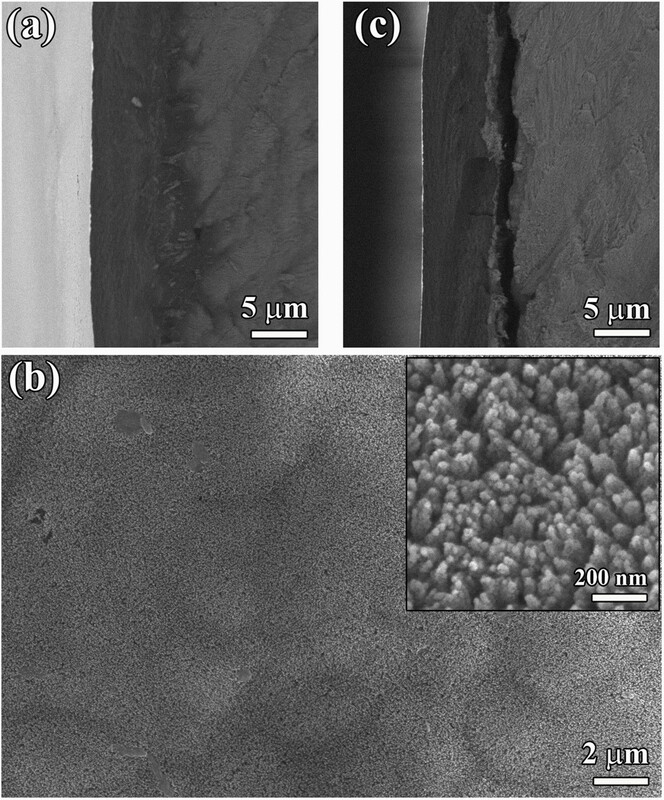 After repair by amelogenin-chitosan hydrogel, the mechanical properties of the etched enamel surface were remarkably improved. 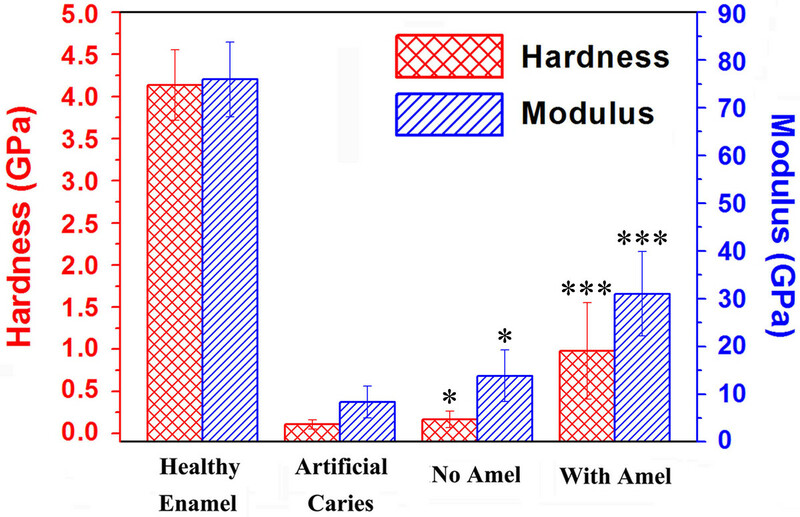 The CS-AMEL hydrogel-repaired enamel showed significantly greater hardness and elastic modulus than control samples because of the organized bundles of apatite crystals similar to enamel structure21. The technique however has the following limitations: (i) the hardness and modulus still do not meet the level of natural healthy enamel due to the presence of organic material and lack of heirarchial prismatic-interprismatic structure; (ii) the extended amount of time (3-7 days) needed for drying the hydrogel and mineralization to complete. Further studies are needed to overcome the above limitations. One possible strategy to improve mechanical properties will be the repeated application of CS-AMEL hydrogel as an effective way to obtain a thicker repaired layer. Digestion of the organic material during the mineralization process is another strategy for improving mechanical properties. Experiments are in progress to shorten the drying time of the hydrogel as well as the mineralization progress 22. In addition, it is necessary to develop a caries model system that account for the effects of salivary proteins on crystal growth. In preparing the CS-AMEL hydrogel for enamel reconstruction, one of the most critical steps for achieving an enamel-like layer with a dense interface is adjusting the pH value of hydrogel due to the pH-dependent interaction between chitosan and amelogenin16. Chitosan is a linear chain polysaccharide comprising glucosamine and N-acetyl glucosamine residues joined together by β-1,4-glycosidic bonds. Because of its amino groups, the chemical and physical properties of chitosan can be tuned by varying the pH values of the media. For example, in a CS-AMEL system, at lower pH values, chitosan interacted with amelogenin through electrostatic interaction, however at pH higher than 5.5, the chitosan interaction was weak due to its low solubility and deprotonation16. This pH-responsiveness feature makes chitosan hydrogel not only an ideal amelogenin carrier, but also an effective layer protecting enamel from erosion. In an acidic oral environment, the amino group of chitosan could capture the hydrogen ions, forming a positive barrier to prevent the diffusion of hydrogen ions to the enamel surface, as well as interacting with amelogenin to avoid its loss into the saliva. When the normal pH is restored by saliva the amelogenin is released from CS-AMEL hydrogel to control the regrowth of enamel. During the enamel regrowth, amelogenin presence is a critical factor in controlling the oriented and elongated growth of apatite crystals. In a CS-AMEL hydrogel, the pre-nucleation Ca-P clusters, stabilized by amelogenin, aggregate to form linear chains which further fuse with enamel crystals and ultimately transforms in to enamel-like apatite crystals16,23-24. The continuous growth of crystals forms a dense interface, which promotes an excellent bond between the newly grown layer and the enamel. In summary, we introduce a promising amelogenin-chitosan (CS-AMEL) hydrogel for superficial enamel reconstruction. The organized enamel-like microstructure formed in the hydrogel can significantly improve the mechanical properties of etched enamel; meanwhile, the robust attachment of the repaired layer can avoid the formation of new caries at the margin of the restoration and potentially improve the durability of restorations. The authors would like to thank Prof. Steven Nutt and Mr. Yuzheng Zhang for assistant with the Focus Ion Beam, and the Center for Electron Microscopy and Microanalysis (CEMMA) at USC for electron microscopy. Research was supported by NIH-NIDCR grants; DE-13414 and DE-020099 to J.M.O. Human third molar Ostrow School of Dentistry of the University of Southern California N/A The human molars were extracted following the standard procedures for extraction at the Ostrow School of Dentistry of the University of Southern California and handled with the approval of the Institutional Review Board. Moradian-Oldak, J. Protein- mediated enamel mineralization. Frontiers in Bioscience. 17, 1996-2023 (2012). Palmer, L. C., Newcomb, C. J., Kaltz, S. R., Spoerke, E. D., Stupp, S. I. Biomimetic Systems for Hydroxyapatite Mineralization Inspired By Bone and Enamel. Chem. Rev. 108, 4754-4783 (2008). Onuma, K., Yamagishi, K., Oyane, A. Nucleation and growth of hydroxyapatite nanocrystals for nondestructive repair of early caries lesions. J. Cryst. Growth. 282, 199-207 (2005). Xie, R. Q., Feng, Z. D., Li, S. W., Xu, B. B. EDTA-Assisted Self-Assembly of Fluoride-Substituted Hydroxyapatite Coating on Enamel Substrate. Cryst. Growth Des. 11, 5206-5214 (2011). Li, L., et al. Bio-Inspired Enamel Repair via Glu-Directed Assembly of Apatite Nanoparticles: an Approach to Biomaterials with Optimal Characteristics. Advanced Materials. 23, (2011). Yin, Y. J., Yun, S., Fang, J. S., Chen, H. F. Chemical regeneration of human tooth enamel under near-physiological conditions. Chem. Commun. 5892-5894 (2009). Fan, Y., Sun, Z., Moradian-Oldak, J. Controlled remineralization of enamel in the presence of amelogenin and fluoride. Biomaterials. 30, 478-483 (2009). Li, L., et al. Repair of enamel by using hydroxyapatite nanoparticles as the building blocks. J. Mater. Chem. 18, 4079-4084 (2008). Chen, H., et al. Acellular synthesis of a human enamel-like microstructure. Advanced Materials. 18, (2006). Yamagishi, K., et al. A synthetic enamel for rapid tooth repair. Nature. 433, 819-819 (2005). Bleek, K., Taubert, A. New developments in polymer-controlled, bioinspired calcium phosphate mineralization from aqueous solution. Acta Biomaterialia. 9, 6283-6321 (2013). Fletcher, J., Walsh, D., Fowler, C. E., Mann, S. Electrospun mats of PVP/ACP nanofibres for remineralization of enamel tooth surfaces. Crystengcomm. 13, 3692-3697 (2011). Fang, P. -A., Conway, J. F., Margolis, H. C., Simmer, J. P., Beniash, E. Hierarchical self-assembly of amelogenin and the regulation of biomineralization at the nanoscale. Proceedings of the National Academy of Sciences of the United States of America. 108, 14097-14102 (2011). Yang, X., et al. How Amelogenin Orchestrates the Organization of Hierarchical Elongated Microstructures of Apatite. Journal of Physical Chemistry B. 114, 2293-2300 (2010). Li, H., Fujiki, Y., Sada, K., Estroff, L. A. Gel incorporation inside of organic single crystals grown in agarose hydrogels. Crystengcomm. 13, 1060-1062 (2011). Ruan, Q., Zhang, Y., Yang, X., Nutt, S., Moradian-Oldak, J. An amelogenin-chitosan matrix promotes assembly of an enamel-like layer with a dense interface. Acta Biomater. 9, 7289-7297 (2013). Hu, C. C., et al. Cloning, cDNA sequence, and alternative splicing of porcine amelogenin mRNAs. Journal of Dental Research. 75, 1735-1741 (1996). Bromley, K. M., et al. Amelogenin Processing by MMP-20 Prevents Protein Occlusion Inside Calcite Crystals. Cryst. Growth Des. 12, 4897-4905 (2012). Fan, Y., Sun, Z., Abbott, C., Moradian-Oldak, J. A enamel inspired nanocomposite fabrication through amelogenin supramolecular assembly. Biomaterials. 28, 3034-3042 (2007). Wright, J. The molecular etiologies and associated phenotypes of amelogenesis imperfecta. Am. J. Med. Gent. A. 140, (23), 2547-2555 (2006). Eimar, H., et al. Regulation of enamel hardness by its crystallographic dimensions. Acta Biomaterialia. 8, 3400-3410 (2012). Ruan, Q., Siddiqah, N., Li, X., Nutt, S., Moradian-Oldak, J. Amelogenin-chitosan matrix for human enamel regrowth: effects of viscosity and supersaturation degree. Connect Tissue Res. (2014). Pouget, E. M., et al. The Initial Stages of Template-Controlled CaCO3 Formation Revealed by Cryo-TEM. Science. 323, 1455-1458 (2009). Gebauer, D., Volkel, A., Colfen, H. Stable Prenucleation Calcium Carbonate Clusters. Science. 322, 1819-1822 (2008).